Integrins are heterodimeric surface receptors consisting of one α-chain and one ß-chain. There are 18 α-chains and 8 ß-chains, resulting in 24 combinations that define ligand specificity. Binding of the respective ligand activates signaling cascades, relaying information from the environment to the inside of the cell (outside-in signaling) and regulating pivotal biological functions such as proliferation, growth, differentiation, or apoptosis. By establishing a Tamoxifen (Tx) inducible knockout mouse, we have demonstrated that the extracellular matrix glycoprotein fibronectin (Fn), activates critical survival signals via ß1 integrin following myocardial infarction (1). In a second study, we have shown that fibronectin is essential for pathological cardiac hypertrophy upon pressure-overload and ultimately leads to heart failure. Whereas, physiological growth due to endurance exercise training is independent of fibronectin (2). In a DFG funded project we are currently dissecting the role of integrin receptors in cardiac hypertrophy in vitro and in vivo by applying the conditional Tx-driven Cre-lox technology. Figure 1: Confocal immunohistochemistry showing fibronectin (Fn, white), actin (red) and nuclei (blue) in hearts of wildtype mice (left) and Fn knockout mice (right) 3 weeks after sham operation (top) or after transverse aortic constriction (TAC, bottom). Pressure overload induces fibronectin expression in control animals (left), which is significantly reduced in the knockout animals (right). Inhibition of Fibronectin attenuates development of heart failure (Konstandin et. al. ; 2013, Basic Res. Cardiol.). Although integrins are highly expressed on the cell surface, they do not bind their respective ligand unless activated from within the cell (inside-out signaling). This tightly controlled process is pivotal during leukocyte migration and recruitment to the site of inflammation, as well as metastasis of cancer cells. ß2 integrin activation on T cells is also a critical step during the process of extravasation and recruitment of T cells within the atherosclerotic plaque. We recently established a novel flow-cytometry based whole blood application to quantify functional ß2 integrin activation (induction of affinity and avidity) on T cell subpopulations. 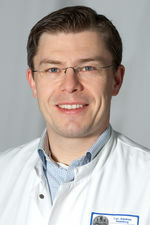 With this technique, we can demonstrate that ß2 integrin activation on T cells in patients with acute coronary syndrome (ACS), precedes future cardiovascular events and provides additional prognostic information over established biomarkers such as cardiac troponin (cTnT) or high-sensitive C-reactive protein (hsCRP) (6). The aim of this project is to characterize differentially regulated signaling cascades in T cell subpopulations and verify the relevance of these pathways for the progression of atherosclerosis in established mouse models. (B) In an additional fluorescence channel ß2 integrin activity was analysed in a control (left) and a patient with myocardial infarction (right). 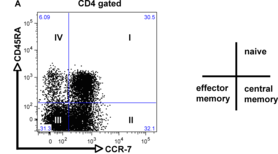 Only cells from subset III in Fig 3A are depicted (Konstandin et al 2009, Basic Res. Cardiol.). Cardiac hypertrophy occurs in response to increased workload and can diverge into two modalities, pathological or physiological growth. Pathological remodeling, upon aortic stenosis or hypertension, is associated with increased mortality. Physiological growth, through endurance training, has no detrimental impact upon survival and is even beneficial for the pathologically stressed heart. A notable characteristic defining hypertrophy is alterations in metabolism. Ordinarily, the heart utilizes fatty acids as a main fuel source, however, pathological remodeling and deterioration of cardiac function correlates with ATP deprivation and a fuel shift away from fatty acid oxidation (FAO) towards glucose metabolism. In contrast, physiological hypertrophy is accompanied by increases in FAO rates, the capacity for mitochondrial respiration, and ATP synthesis. In this project we analyze effects of extracellular cues for hypertrophic remodeling and examine transcription factor circuits regulating metabolic reprogramming. Taking advantage of siRNA and the cre-lox technology for cardiomyocyte specific knockouts, experiments are performed in vivo and in vitro to assess causality of the respective proteins in the heart. Figure 3: Fibronectin (Fn, right) stimulates hypertrophy of cardiomyocytes in vitro and induces translocation of the transcription factor NFAT (nuclear factor of activated T cells) from the cytoplasm to the nucleus. Neonatal rat cardiomyocytes were infected with GFP-tagged NFAT (green) and stained for desmin (red) as well as nuclei (blue, Konstandin et. al. ; 2013, Basic Res. Cardiol.). A broad spectrum of state-of-the-art techniques are applied in the laboratory including employing multi-color flow cytometry for phenotyping and functional analysis of integrin activation, cellular apoptosis, cell cycle and proliferation. Other techniques utilized in the lab are high throughput screening for cell size analysis, Seahorse technology for mitochondrial respiration, confocal microscopy, real time PCR, immunoblot, immunhiostochemistry, ELISAs, etc. Primary cells (cardiomyocytes, hematopoietic stem cells, t cells) and cell lines (macrophages, HEk293s, HeLa) are used for in vitro experiments. Applications in vitro include siRNA treatment, adenoviral, or lentiviral infection. Relevance of our in vitro findings are confirmed in in vivo mouse models (myocardial infarction, transverse aortic banding, endurance exercise, atherosclerosis model), including genetic knockout mice. To evaluate cardiac function small animal echocardiography is applied. MTA: Vera Sonntag-Buck, Dipl. Biol. Medical Student: Jennifer Furkel, cand. med. Konstandin, M.H., Toko, H., Gastelum, G.M., Quijada, P.J., De La Torre, A., Quintana, M., Collins, B., Din, S., Avitabile, D., Volkers, M.J., et al.. Fibronectin is Essential for Reparative Cardiac Progenitor Cell Response Following Myocardial Infarction. Circulation research. 2013. Jul 5;113(2):115-25. Volkers M, Konstandin MH, Doroudgar S, Toko H, Quijada P, Din S, Joyo A, Ornelas L, Samse K, Thuerauf DJ, Gude N, Glembotski CC, Sussman MA. 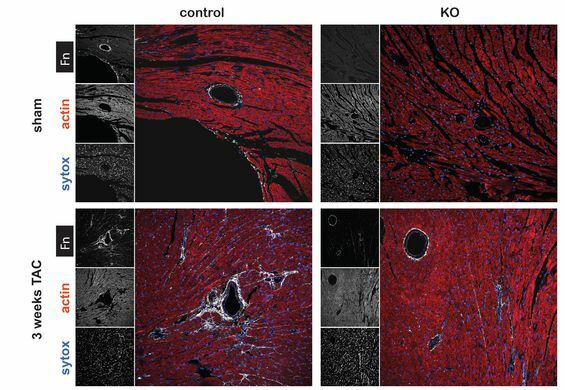 Mtorc2 protects the heart from ischemic damage. Circulation. 2013. Nov 5;128(19):2132-44. Toko, H., Konstandin, M.H., Doroudgar, S., Ormachea, L., Joyo, E., Joyo, A.Y., Din, S., Gude, N.A., Collins, B., Volkers, M., et al. Regulation of cardiac hypertrophic signaling by prolyl isomerase pin1. Circulation Research. 2013. 112, 1244-1252. Konstandin MH, Aksoy H, Wabnitz GH, Volz C, Erbel C, Kirchgessner H, Giannitsis E, Katus HA, Samstag Y, Dengler TJ. Beta2-integrin activation on T cell subsets is an independent prognostic factor in unstable angina pectoris. Basic Res Cardiol. 2009 May;104(3):341-51. Din S, Konstandin MH, Johnson B, Emathinger JM, Volkers M, Toko H, Collins B, Ormachea L, Samse KM, Kubli DA, De La Torre A, Kraft AS, Gustafsson AB, Kelly DP, Sussman MA. Metabolic Dysfunction Consistent with Premature Aging Results from Deletion of Pim Kinases. Circulation Research. 2014 Jul 18;115(3):376-87.